Traditionally, flags have always been viewed as a prime symbol of social, cultural or political identity. The more counter pressure exerted against the symbol the greater the zeal of the "true believer" to identify with the image. During times of great national stress, particularly war, the symbol is elevated to an almost religious significance. The Civil War, the conflict between north and south, exemplified the devotion attached to a national flag. For the north, the 33 stars and 13 bars, would be carried onto the battlefield and during the course of the war 3 stars would be added for new state admissions. On the other hand, the Confederate states, seven secessionists to begin with in 1861, the absence of a national flag would be immediately addressed by the Confederate congress. Initially, there was southern sentiment, to utilize the South Carolina palmetto tree flag which had existed in various designs since 1775. On December 17, 1860, there was unanimity to secede from the Union and a victory for sectionalism. There were voices raised in support of the Bonnie Blue flag. The Cross of St. George was also flown over the Columbia South Carolina convention. Below, a later version with full complement of secessionist states represented in the 15 stars. A Jewish member of the South Carolina delegation, Charles Moise, raised objection to the St. George flag. He wrote that the national flag should not be "the symbol of a particular religion" referencing the Latin cross. Apparently, there were other objections from some Protestant sects. The St. George flag was scrapped. As early as February 9, 1861, the new Confederate Provisional Congress entertained the challenge of adopting a national flag. They had already bound themselves in their Constitution to the autonomy of each of their states, and they sought a similar expression in their new flag. William Miles (South Carolina) was appointed to lead the Committee on the Flag and Seals. He sought ideas from southern citizens. 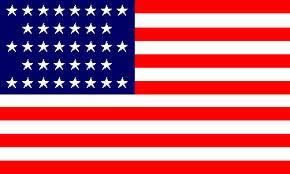 Some believed that they should adopt their version of the Union's stars and stripes. Others rejected that flag as a symbol of tyranny. Miles punctuated that sentiment thusly: "It is idle to talk of "keeping" the flag of the United States when we have voluntarily seceded from them". Miles graciously acceded to Charles Moise and then suggested a diagonal cross pointing out that symbol was a heraldic design known as a saltier without religious connotation--not completely accurate. However, there remained an affinity for the Federal flag style. Instead of stars and stripes, the rebels chose stars and bars from the submitted samples effective March 4, 1861. 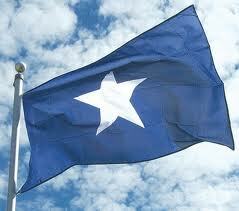 By November 28, a variation which included stars for the last seceding states was introduced and was flown as a national flag until May 1, 1863. On July 21, 1861, the belligerents clashed in the first significant battle of the war at Bull Run. The calculus attached to the new flag on the battlefield and its similarity to the Union flag was overlooked. The Confederate national symbol blended with numerous regimental flags, southern state flags and, significantly, with the Union flag. The latter, reportedly, resulted in weaponry being misdirected onto friendly regiments. General P.G.T. Beauregard recommended that the Confederacy should be represented on the field with a battle flag, and reserve the "stars and bars" as a" peace or parade flag". The exigencies created on the battle field required prompt attention and a degree of uniformity was always a necessity for an army. Two sisters and their cousin from Alabama were contacted by the army's quartermaster and contracted to produce models of the St. Andrew's cross that had been originally promoted by William Miles as the national flag. The design would be quickly adopted and flags were distributed to Generals Beauregard, Johnston and Van Dorn. The Hetty Cary flag was produced on silk material. The size of the flag denominated the branch of service: infantry 46 inches, artillery 36 inches, 30 inches for the cavalry. Although this national symbol never was adopted as the national flag, its image was miniaturized and included in the second national flag approved by Jefferson Davis on May 1, 1863. 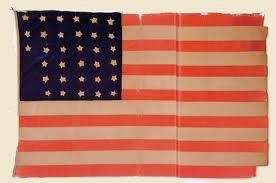 This flag was utilized until almost wars end with a brief one month variation prior to surrender April 9, 1865. The added red bar on the outer margin was to rectify what might appear to the enemy as a flag of truce. The white background was referred to as the "Stainless Banner". Some read an intent to create a "white man's flag" which was not the motivation of the design. The flag was inaugurated when draped over the coffin of General Stonewall Jackson. Flags appeared in all army camps. Below, the flag of the Union decorated a tent entrance of a New York engineer unit at the start of the war. In contrast, the battle flag of General Robert E.Lee's headquarters flew over his tent when in the field. On the home front, flags were displayed by civilians from homes and public buildings. This was an aberration. Prior to the war, the stars and stripes was almost exclusively flown on a ship's mast or on some federal facilities. Recruiting posters in the north displayed the flag with the text, "Protect our glorious flag". the South was no less patriotic. Their "stars and bars", confusing on the battlefield grandly flew over the state house in Montgomery and also appeared on kitchen apparel. It was not sufficient to merely idolize your nation's flag, it was expected that your intense hatred be directed against your enemy's symbol. In Memphis, Tennessee, the Union flag received a public burial. In other southern towns, the American flag was burned.In 1861, the Confederate Congress passed the Alien Enemies Act that promised prosecution to any one flying the Union flag. Down with the new one! In January 1861, Secretary of Treasury. John A. Dixon, a member of the cabinet of the outgoing President Buchanan, authorized the seizure of a naval ship. HE ordered "If any one attempts to haul down the American flag, shoot him on the spot". On May 24, 1861, Colonel Elmore Ellsworth, First Regiment of New York Fire Zouave, in performance of his duty, entered an inn, Marshall House, in Arlington, Virginia. He demanded that the proprietor cut down the Confederate Stars and Bars. The response was a bullet that mortally wounded him. He was honored by President Lincoln, a personal friend, and his body lie in state in the East Room of the White House. Mary Todd Lincoln took possession of the bloody Confederate flag, and hid it in a drawer. Colonel Ellsworth was the first of many officers to fall in the war. The New York Times reported that Maj. Gen. Benjamin Franklin Butler carried out the death sentence for tearing down the American flag, and "effectually made the flag feared and respected from that time on". On April 25, 1862, Flag Officer, David C. Farragut, born in Tennessee and raised in Virginia, but dedicated to the Union, defeated the Confederate Mississippi Squadron, ordered the mayor of New Orleans to remove the state flag from the building of the United States Mint. When he refused, Farragut warned that he would raise the town. Mayor Monroe acceded. Sergeants were honored to carry the national flag. These "color guards" secured the flag with their lives. They went into battle unarmed and loss of the flag meant to be dishonored. 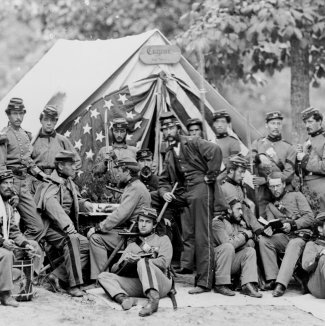 They were accompanied by armed "color corporals" who were ordered only to fire if the flag was attacked. Enemy soldiers considered a captured flag a prize and a symbol of victory. Prisoners hid shreds of their flag and used that to cheer their mates.When African Americans were permitted to serve the Union in 1863, they waved the flag at their rallies. A Corporal Price Lambkin entered this note in his journal: "We had liberty under it for eighteen hundred and sixty-two years, and we'll die for it now". "Shoot if you must. this old gray head, but spare your country's flag". Jackson responded: "Who touches a hair on yon gray head dies like a dog! March on"! Brevert Maj. Gen. Joshua Lawrence Chamberlain -destined to be a Medal of Honor recipient (1893) - was charged by General Ulysses S. Grant, to accept the surrender of arms by the Confederate forces on April 9, 1865. He later recalled that the enemy "tenderly folded the battle worn and bloodied flags"and lay them down next to their stacked arms. The ultimate embarrassment. Chamberlain stated: "And only the Flag of the Union greets the sky". It would contain 36 stars. On February 18, 1865, Union soldiers recaptured Fort Sumter. The circle of the Civil War that started at this Charleston Harbor fort was about to close. The 1861 flag would become an honored relic with its display of all 34 states before the defection of 11 southern states. Adding a star for Kentucky and Missouri was literally "a tug of war". Both sides claimed sovereignty, but the north's manpower in the field tipped the balance in its favor. On April 14, 1865, Major General Robert Anderson raised the new Union flag over Fort Sumter amid cheers and a 100 gun salute. That night, President Abraham Lincoln was assassinated. Encyclopedia of Virginia, Virginia Foundation of the Humanities w/ Library of Congress. 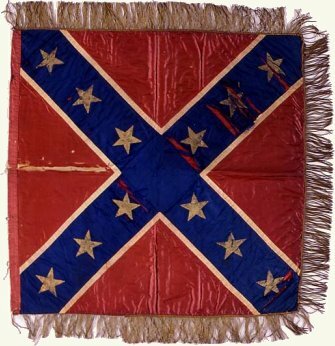 Coski,John M. Confederate Battle Flag. The Belknap Press of Harvard University Press, Cambridge, Ma 2005. Flag An American Biography, editors: Marc Leepson, Thomas Dunne Books, St. Martin's Press. New York 2005. Library of Congress Desk Reference. Margaret E. Wagner, Gary W. Gallagher, Paul Finkelman, A Grand Central Press Book, Simon Schuster, New York 2002.